Her side of the closet. His side of the closet. 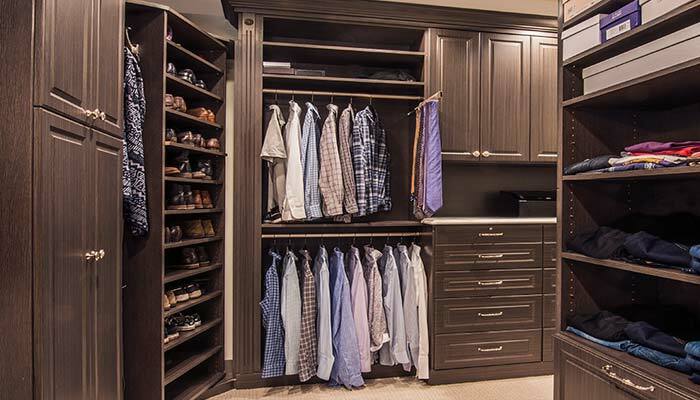 Elegance and practicality need not be mutually exclusive and this L shaped walk in closet proves the point! Built for two, this custom master closet design offers a grand space for her, complete with a dressing table under the oval window and plenty of hanging with room to separate winter from summer clothing. This built in dressing table/desk transforms the space beyond master closet to become a fully functioning dressing room. The three drawers under the dressing table are perfect for organizing hairbrushes, makeup, barrettes and other hair accessories. 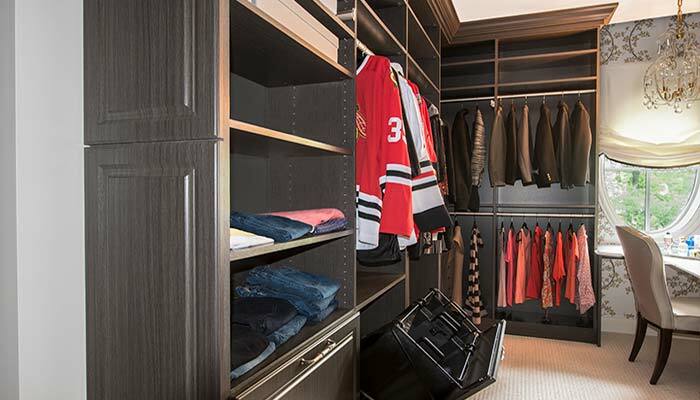 A pull-out valet pole closet accessory helps to organize that perfect outfit when in a rush. Two double tilt-out hampers corral all the dirty clothes, and separate compartments allow for organization of lights from darks, dry clean only and hand washables. A plethora of shelving space keeps jeans, casual tops and knits nicely folded. 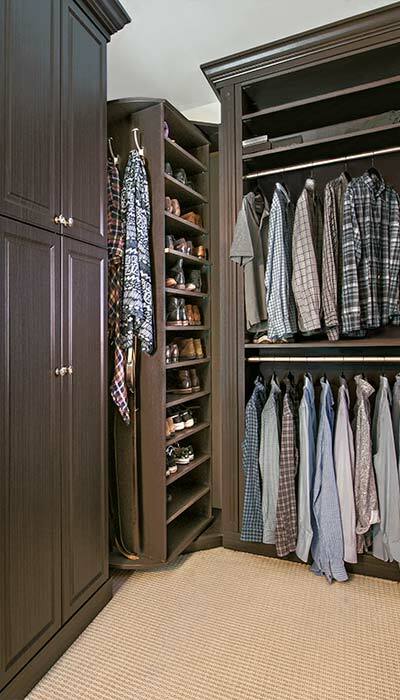 His side of the master closet features double hanging for shirts and slacks with a telescoping tie organizer. In the corner of this L shaped closet is a 360 Organizer®. This floor to ceiling rotating closet organizer offers the maximum storage possible within the smallest space. It's perfect for converting those otherwise dead corners into useful storage. This Shoe Spinner model has been customized to specifically fit the owners' needs. Instead of for sides of shelves, this couple opted for a full-length mirror on one side and hooks to hold a collection of belts and scarves on the other. The remaining two sides feature shoe shelves for each spouse's footware. The addition of eight extra shelves over the standard model creates a total of twenty four rotating shelves for storing shoes, purses, etc. The triple closet hutch on his side of the closet easily provides all the drawer and countertop storage any couple could want. Having a unit like this in the master closet design could easily eliminate the need for the placement of other furniture in the bedroom.